A frightening trend is spreading across Europe: a rise of nationalism built upon xenophobic rhetoric. This momentum is challenging the dominant electoral framework and governability of various governments. The recent German and Italian elections demonstrated a failure of the establishment parties to connect with a frustrated electorate. Angela Merkel struggled to form another Grand Coalition, after the Social Democrats achieved historic post war electoral lows, and the xenophobic driven AfD party achieved historic success. The Italian elections have resulted in a legislative crisis, in which the insurgent League and Five Star Movement achieved more success than the establishment left and right parties, throwing the country into a hung parliament. This shift away from the post war establishment parties is also seen in France, where the presidential runoff featured the new centrist party En Marche led by Emmanuel Macron, against the xenophobic nationalist party Front National led by Marine Le Pen. This was the first time in the Fifth Republic that neither mainstream party, the Socialists nor Republicans, made the second round. The trend continues to various other countries including: Austria (The Freedom Party), Greece (Golden Dawn), Denmark (Danish People’s Party), Netherlands (PVV). What is the connection between these electoral results? A discontent of the status quo. Whether it be the remaining economic insecurity following the crash in 2008, austerity policies, the democratic deficit within the European Union, or the failure of the European Union to adequately handle the refugee crisis, voters are in search for an alternative. The right-wing nationalist movements have been especially adept at picking up on voters fears and anxieties, through directing their anger at the ‘outsider.’ These movements have been able to build transnational connections, through far-right conferences and appearances at various party events. Most recently, Steve Bannon, Trump’s former campaign manager and strategist, has been on a tour around Europe, speaking at the National Front conference in France, and demonstrating his support for the recent electoral success of the League movement in Italy. The right-wing nationalists’ ability both to define a clear antagonistic front, as well as build a transnational movement ought to be a sharp wake-up call for the left. In order to prevent a dystopian neo-fascist and technologically advanced Europe, the left needs to offer an alternative that likewise speaks to people’s emotions. Instead of an appeal to the center, the left needs to build a transnational movement with a clear and positively defined agenda of its own. An agenda that expresses a break from austerity measures. An agenda not just based on identity politics, but an alternative economic vision away from the neo-liberal hegemony. An agenda not built off the fear of others but an optimism directed towards humanism and pacifism. The right-wing nationalists currently have the momentum, but the left can recover, and it must in order to prevent society from stepping into the harrowing trap of 1930’s Europe. 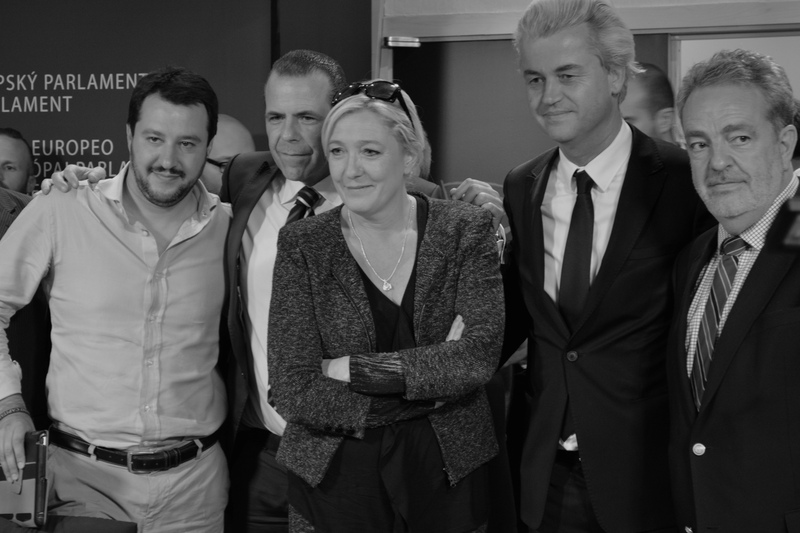 Image Courtesy of Euractiv, Salvini (Lega Nord), Vilimsky (FPÖ), Le Pen (FN), Wilders (PVV), Annemans (VB).